Corruption and Dependence: South Africa’s road to ruin or salvation? The presence of corruption from the top to the bottom rungs of the ANC government has detrimental consequences for the South African public sector and economy. These consequences may have important electoral implications for the ANC. Will corruption lead the country to ruin or will it lead to the ANC's own ruin? Anyone who visited Tunis during the last few years could not have failed to be impressed by the thriving capital city. I visited Tunis in 2006 to attend a conference of the African Development Bank. I would never have guessed that five years later the country would be gripped by an angry insurrection that would force the powerful President Ben Ali to flee to Saudi Arabia. Everything about Tunis looked pristine especially its gleaming white buildings. The African Development Bank which had emigrated from the turbulent climes of the Ivory Coast where it was headquartered had also assumed that there was no better place to relocate to than along the genteel shores of the Mediterranean. Well, we now know better - appearances can be deceptive. South Africa and Tunisia are at the opposite ends of the vast African continent but share some commonalities. One of the sparks that ignited what turned out to have been a tinderbox despite its many positive economic indicators was the issue of corruption. The population had had enough of corruption by the powers that be but especially by the President’s family which commanded vast amounts of wealth through business deals. Sounds familiar? During his 23 years as President, Ben Ali’s family came to have fingers in many pies – banking, tourism, telecommunications, distribution, air transport, car dealerships, publishing and influence peddling in general. South Africa’s First Family has been in power for less than two years and already sports iron ore prospecting rights in an existing iron ore mine, oil wells in the Congo, shipping businesses, gold mines and is soon to acquire billions worth of shares in South Africa’s largest steel maker ArcelorMittal to name but a few businesses Zuma’s family is engaged in since he became President in 2009. The wheelings and dealings by the country’s First Family has sent alarm bells ringing even amongst President Zuma’s political admirers, especially the Congress of South African Trade Unions, Cosatu, for understandable reasons. South Africa’s mining industry sits at the core of the country’s economy in many ways. It is an important employer of unskilled black workers, many of them members of Cosatu affiliate, the National Union of Mineworkers. The mining industry is the single largest exporter accounting for more than half of the country’s export earnings. Mines also produce raw materials such as iron ore, coal etc that go into downstream industries such as power generation, steel manufacturing and other engineering industries that employ many members of Cosatu affiliates. Cosatu has woken up to the fact that corruption, even by its friends threatens its members’ livelihoods. In economic terms corruption is an extra tax that must be added to the normal cost of production. This makes the products which carry that extra tax more expensive relative to similar products produced elsewhere, where there is no such an extra cost. Leaving aside the very important moral and political issues not to mention the killings that are happening in the First Families’ gold mines, corruption therefore makes South Africa’s products uncompetitive globally, a road to ruin for South Africa as a country and to investors and workers in the affected industries. Eventually waking up to this reality, Cosatu convened a conference of civil society organisations to map out a strategy for combatting corruption. This infuriated the ANC leadership which denounced the conference as an initiative for promoting regime change. The conference agreed that Cosatu spearhead an initiative to register an anti-corruption civil society organisation to be called Corruption Watch. This process is underway. South Africa is signatory to the African Union’s anti-corruption convention which stipulates that government work with civil society in the fight against corruption. So far this has not happened but must be expected to happen as Cosatu and friends roll out their initiatives. This will surely be yet another point of friction between the ANC and its ally. Corruption is of course not confined to the top of the government. It runs from the top to the bottom. It has become visible that the ANC government is looking for ways to silence reporting on the growing scourge. Last year the government published the Protection of Information Bill which is designed, if passed, to impose hefty prison sentences on whistle blowers and journalists who reveal what the government wants hidden. It was reported at the beginning of last year by Willie Hofmeyr, head of the government’s anti-corruption body, the Special Investigating Unit, SIU that 400 000 civil servants were getting welfare payments to which they were not entitled. A further 6000 senior government officials had failed to declare their business interests. The Minister of Human Settlements, Tokyo Sexwale revealed that 923 corrupt officials in his department had been brought to book over various scams, including the construction of thousands of substandard low-cost home for the poor many of which were unfit for human inhabitation. Finance Minister, Pravin Gordhan at the end of last year said the government was investigating possible tender and procurement fraud involving up to R25-billion. Other sources estimate that R30-billion of South Africa’s R150-billion public procurement budget is lost to corruption. Extensive corruption in all levels of government is leading to internal conflicts and even assassinations amongst officials especially at the local government level. In Mpumalanga it is estimated that a dozen elected officials have been assassinated in connection with illegal procurement related activities during the last two years. The consequences of public sector corruption are multi-faceted. Service delivery protests by poor South Africans who are locked in townships and informal settlements are one of the results of corruption by public sector officials. These protests have been studied extensively by the Municipal IQ a research organisation that specialises in collecting data on local government performance. The graph below gives a clear picture of service delivery trends in the country. As Figure 2 below shows the largest number of service delivery protests occurred in Gauteng followed by the Western Cape. The least number being in Limpopo. 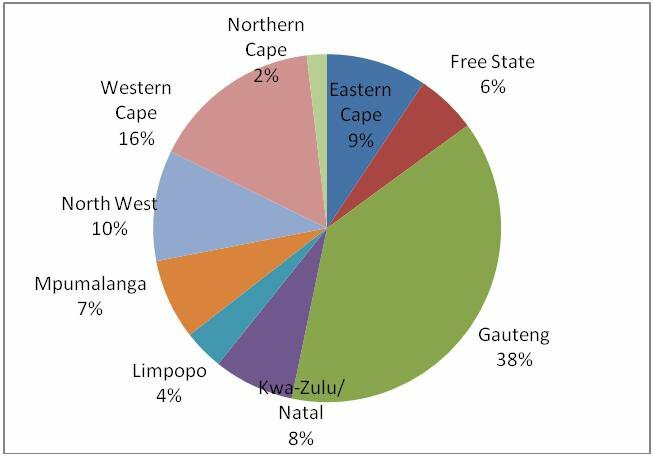 According to Municipal IQ researchers the main reason why Gauteng and the Western Cape are the leading provinces for service delivery protests is because they have cities such Johannesburg, Ekurhuleni and Cape Town that attract migrants. “These cities experience the highest population growth rates of all our localities; and in fact there is a strong statistical link between high levels of migration and servicer delivery protests,” says Municipal IQ. Dissatisfaction with services delivery from the government by the poor has important electoral implications for the ANC. Many observers including leaders of organised labour believe that it is the black working class that votes the ANC into power, the reality is very different. No doubt some workers do vote for the ANC but the core constituencies that keep the ANC in power are the poor and unemployed Africans. In return for their vote the poor receive all sorts of hand outs from the ANC government that go under the generic name of social grants. 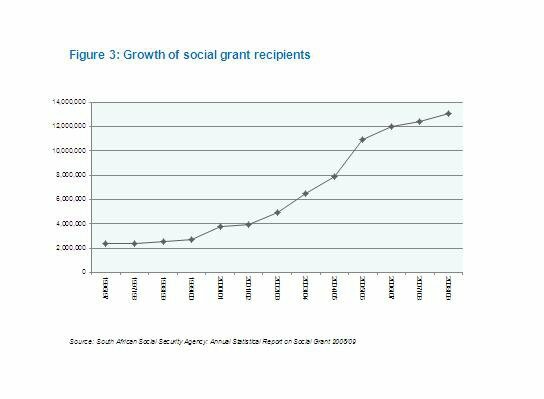 These social grants have been growing steadily since 1997-98. Today they encompass over 14 million people and are scheduled to grow to 18 million in 2013 and they constitute about 15% of government revenues. Twenty years ago the famous South African scenario analyst Clem Sunter said South Africa was approaching a cross roads: one road was the high road and the other was the low road. The high road which obviously he recommended, he said would lead to democracy, political stability and prosperity. Today South Africa is approaching another critical point in its history. In 1994 the leaders of South Africa choose the high road and adopted an inclusive political and economic model. Today the ANC government seems determined, despite its rhetoric, to follow the low road. The high levels of corruption and incompetence in the public sector on one hand are making South Africa an undesirable destination for domestic and foreign investors. According to a recent report by the United Nations Conference on Trade and development foreign direct investment to South Africa dropped by 78% in 2009. The recent Survey of Mining Companies 2009/2010 by Canada’s Fraser Institute, shows that South Africa is slipping constantly over the last few years in the league tables of mining countries. The Fraser Institute attributes this to ill-conceived and ambiguous legislation over mineral rights allocation and Black Economic Empowerment. One of the most glaring “follow the low road policies” of the government is the Kumba Iron Ore saga where the Department of Mineral Resources has allocated prospecting rights to a shelf company owned by the President and Deputy President’s families and their friends to an existing iron ore mine owned by an Anglo American plc subsidiary Kumba Iron Ore Limited. The important question is whether by following the low road the ANC will lead the country to ruin or it will lead to the ANC’s own ruin. An equally important question is will the ANC’s ruin be the salvation of the country as happened with the demise of the National Party, the pioneers of the Apartheid system?